Dare the experience and let yourself be seduced by one of the biggest underwater active volcanos in the world while we are taking care of all organisation details. Departure from the port of Fira. Arrival at the beach of Palea Kameni and swimming in its hot waters of 35 degrees Celsius / 95 degrees Fahrenheit. 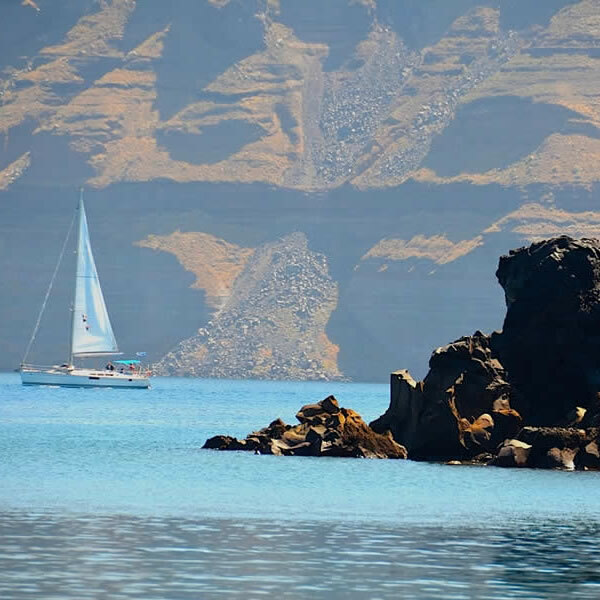 Then, sailing above the crater, we are reaching the small island of Thirassia where you can eat, swim and visit the traditional village of Manola. The excursion continues with a stop at Oia, at the haven of Armeni. From there it’s up to you whether you prefer to return to Fira by boat or to extend your afternoon pleasure by visiting beautiful Oia and return by bus. Send us an e-mail to provide you with details of each excursion and prices.